The time is right to start offering jobs to aspirants out there, it is usually during these times when people go out and try their luck at employment. Manpower is always the top driving force of a small business even if machines have continuously evolved over the years with the advancement in technology. Yes, a lot of tasks that were once done by people are now being done by machines, and this has improved the industry’s productivity level. However, the reason why manpower is still needed is that nothing can ever replace the human’s rational thinking ability and decision-making skills. According to studies and surveys, the best time to look for a job is at the start of the year and continues until the end of spring. By summertime, recruiters often take the time off at taking in applicants due to the season. And besides, job hunters need to go on vacation too. By the start of autumn, the hiring rate rises back up but not as high as during the first month of the year, and this rate slowly declines by the start of winter. Though the hiring rate during December is at its lowest, it actually doesn’t stop, especially for industries who are still in need of manpower. You may also see recruitment flyers. Since summertime is fast approaching, and as we said earlier, job recruiters take a break during this season, now is indeed the best time to open your doors to new employees. 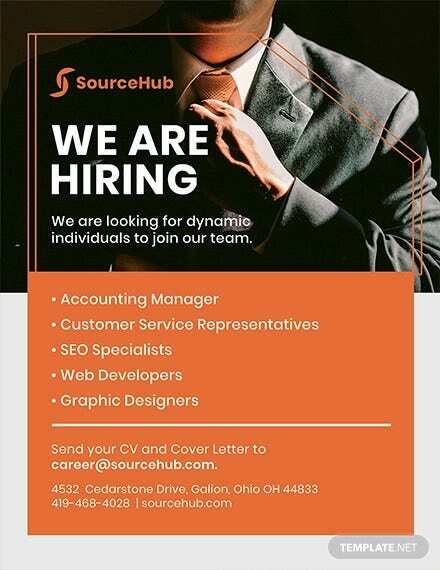 Let the general public know that you are in need of new workers, and what better way of doing that than by advertising it? 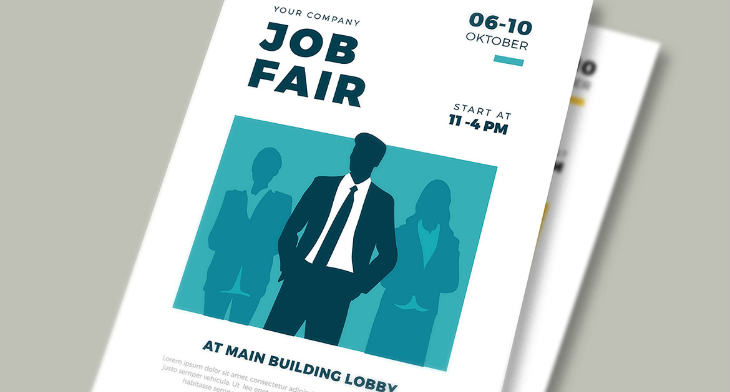 While you may be able to do that by using posters, you can also do it through flyers, and below is a collection of various job flyer designs and templates that you can download and use for such purpose. 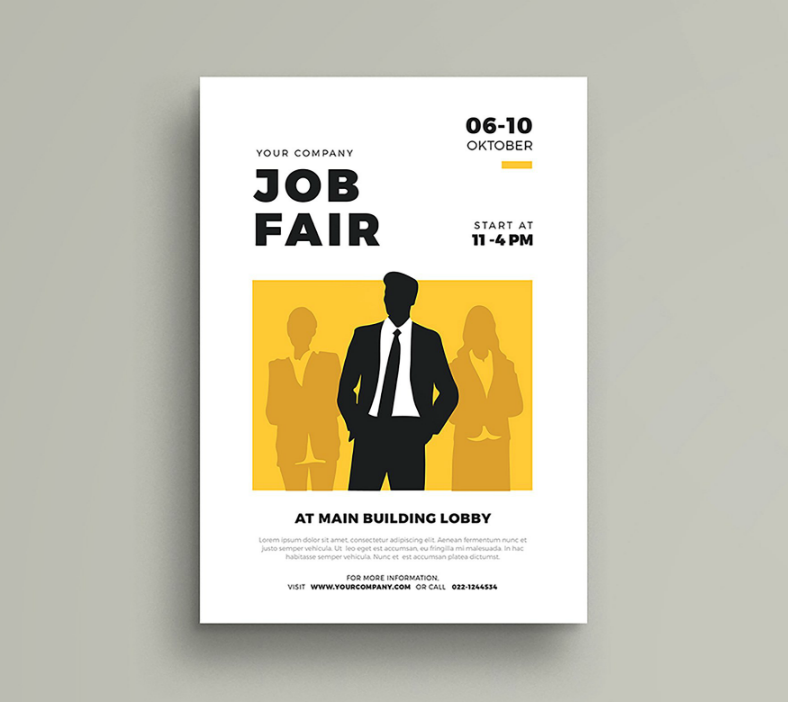 Make it personal, go exclusively typographic with your job flyers by downloading this straightforward job fair flyer sample. 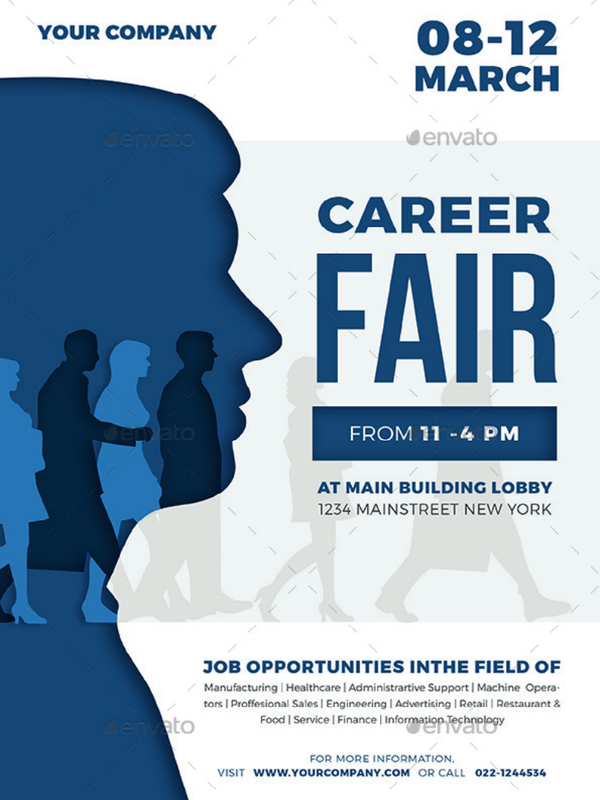 Here is another job fair flyer template that you may be interested in if you prefer to incorporate some graphical elements into the design. However, to keep with the formal theme of this template, the graphical element simply shows silhouette illustrations of individuals wearing business attire. 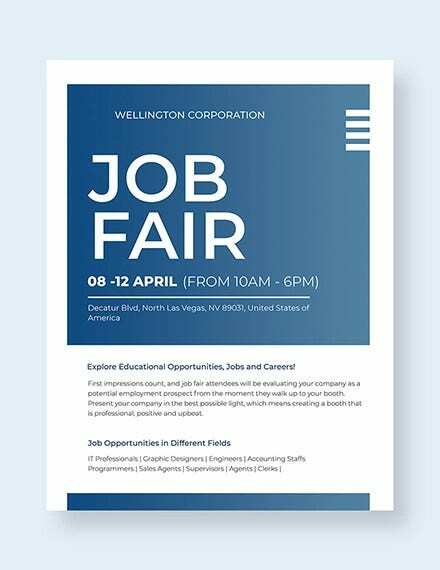 While the first two modern flyer templates talked about job fairs, you might also want to be more specific with regards to the vacancies in your company. 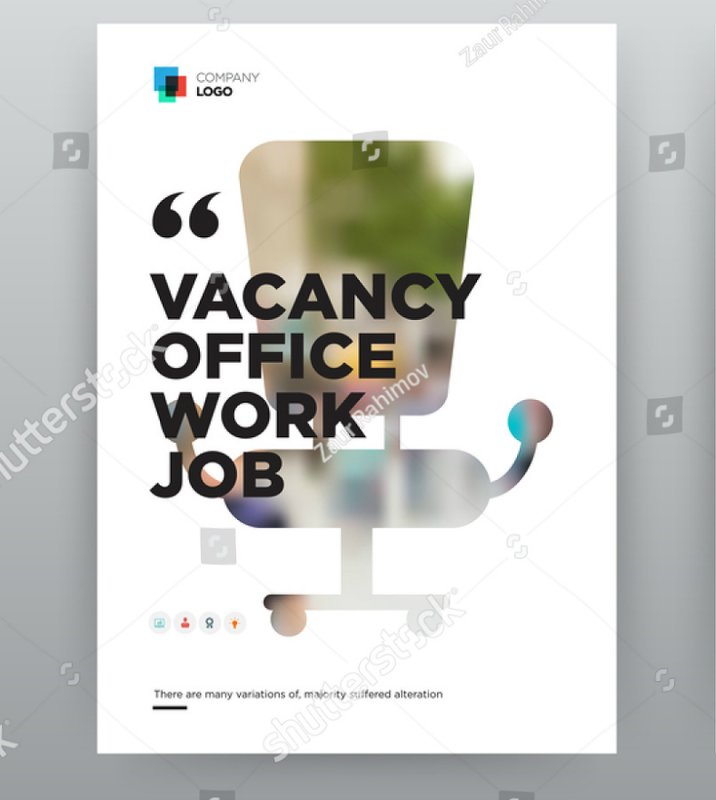 The flyer template above does just that and arranges the different vacant positions in individual text boxes, and this helps in making this flyer easy to read. As mentioned during the introduction of this article, the rate of job hunters and recruiters depend on the time of the year. While this information is something that is more useful for those looking for a job, it would probably be good for job recruiters to know this as well. This way, they’ll also be informed with regards to the best time to look for new hires. 1. January to February. Considered as the most ideal time to look for jobs, it is also the best time for companies and businesses to hire new team members. According to experts and advisers, these two months are the perfect ones for hiring. Though it may seem slow right at the start of January since people will still need to slightly adjust after the end of the vacation days, the rate slowly rises as the month progresses. You may also see volunteer flyers. 2. March to May. Though experts have said that the recruitment rate is at its highest during the first two months of the year, this rate will actually continue over the next three month. Because of this, it is also best to have job openings during the spring season. This strategy is also ideal if you are willing to hire fresh graduates since these months will serve as the preparatory time to those who are about to undergo a transition from being a student to being an employee. 3. June to August. As mentioned in the introduction, job recruiters should also take a break from hiring new employees. But even if you open jobs during these months, the rate of job hunters will be very low since these people will also be taking a time off from job hunting. But then again, there’s actually nothing holding you back from opening jobs during the summertime. 4. September to October. After the three-month vacation period comes the return of job opportunities in the market. While the job hunting rate during this season is not as intense as it was during the first five months, individuals who were not able to land a job during the first half will try their best to find one before the start of the holidays. And for companies, on the other hand, they will also be working hard to fill in vacant positions before the end of the year. 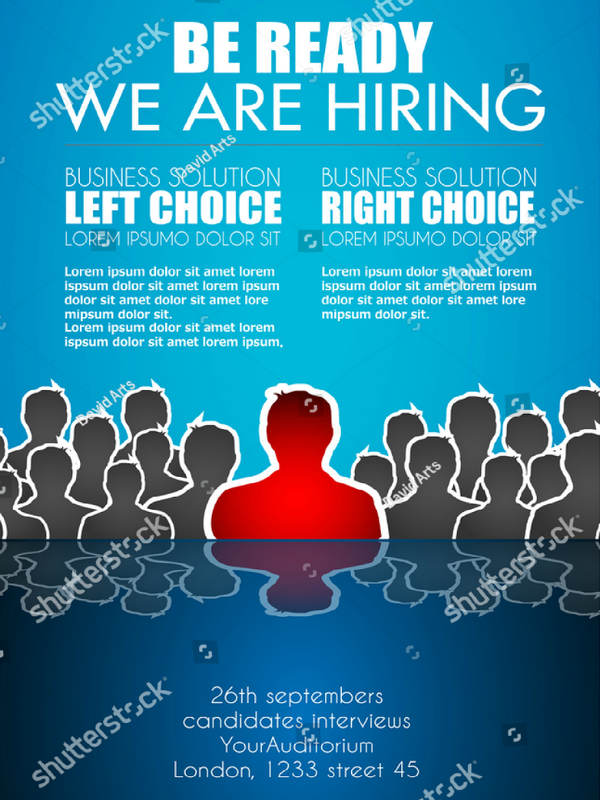 You may also see flyer templates in PSD. 5. November to December. The last two months of the year marks the lowest rate of job hunters since they will be pre-occupied in preparing for the coming Christmas and New Year during these times. But according to experts, it would be best to keep the door open in order to fill in vacancies, if there are still any. 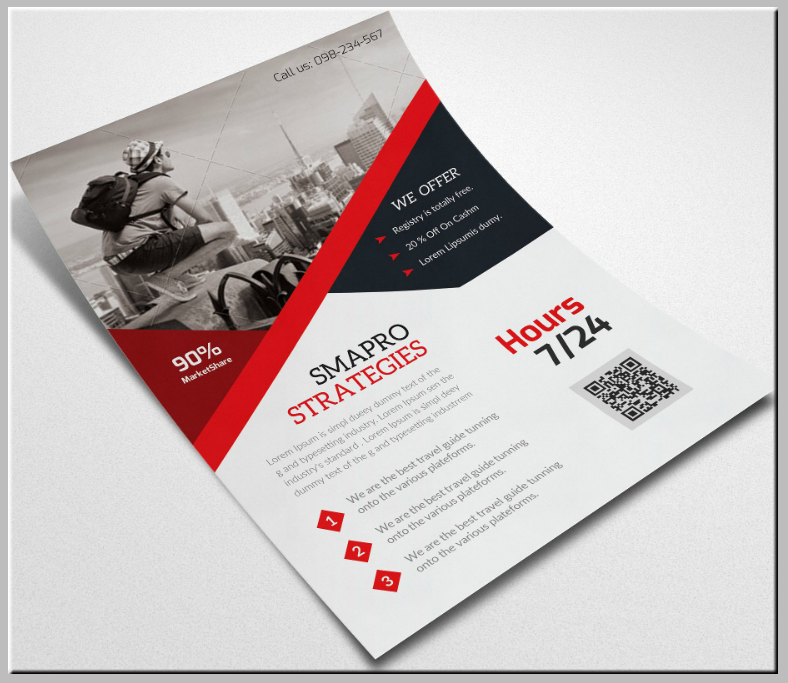 The sample flyer template above may be a perfect choice to those who wish to maximize their use of the entire flyer sheet. 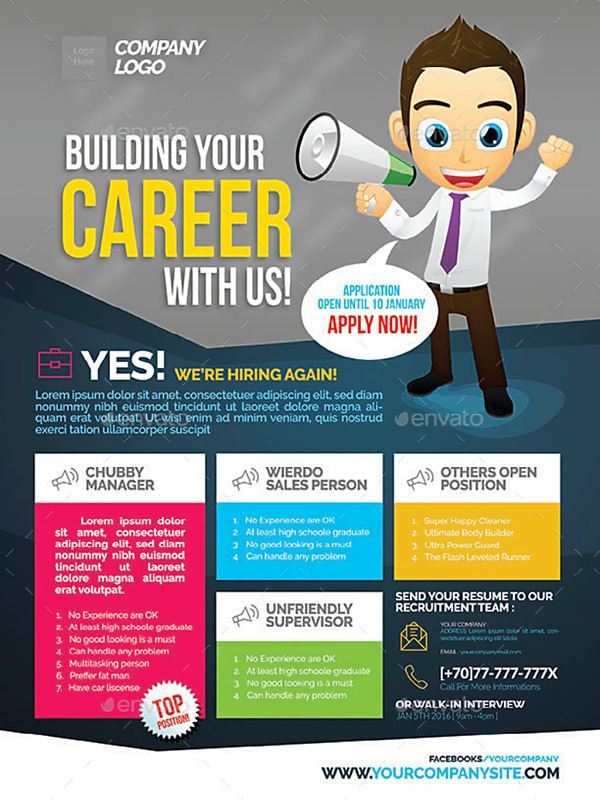 This template lists down the vacant positions at the bottom half of the flyer and also indicates some relevant information about the application process in the middle section of the design. 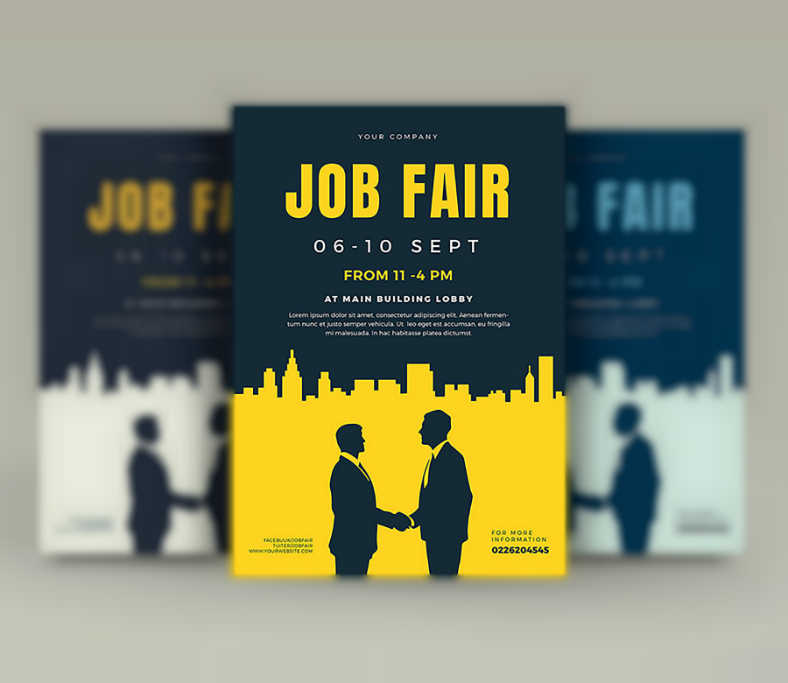 Above is a highly artistic flyer template which makes use of a double exposure illustration, and the best thing about this is that it is still able to keep the formal look of job fair flyers. 1. When making job listings, make sure that it is able to convey what a candidate needs to know about the position, and this includes a brief description of the job, the knowledge and skills that are required, and a short description of who would be ideal in that position. 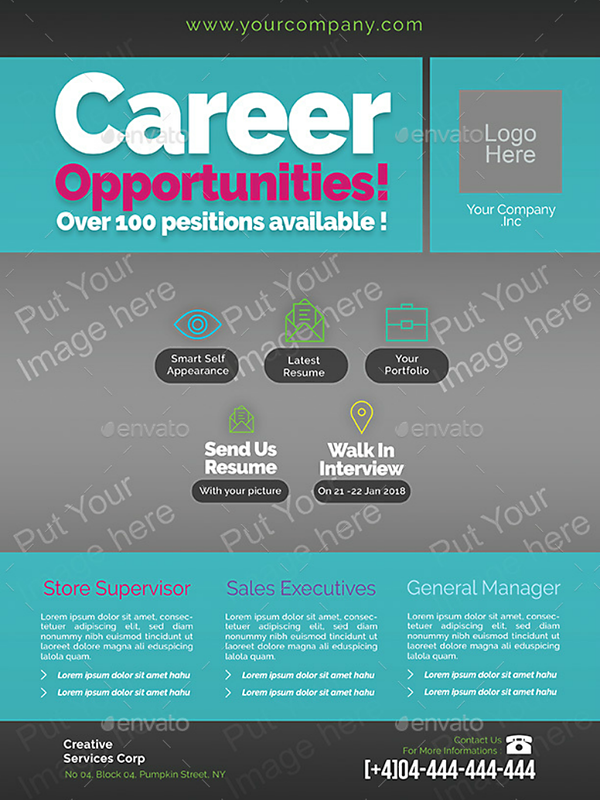 You may also see an example of flyer templates. 2. The application process should go smoothly for the candidates if you don’t want them to back out. This should already start on the job listing when indicating the documents that need to be presented. If you want to keep your candidates, it would be best to make their experience in the process of applying painless. If done well, these candidates may even recommend your company to other job hunters. You may also see printable flyer templates. 3. Take advantage on the use of social media or employment-oriented platforms for writing job listings. Nowadays, many job hunters refer to the internet to look for career opportunities and job openings. And the great thing about this is that it also allows for a more convenient interaction between the candidate and the hiring manager if in case the former has inquiries. You may also see minimal flyer templates. 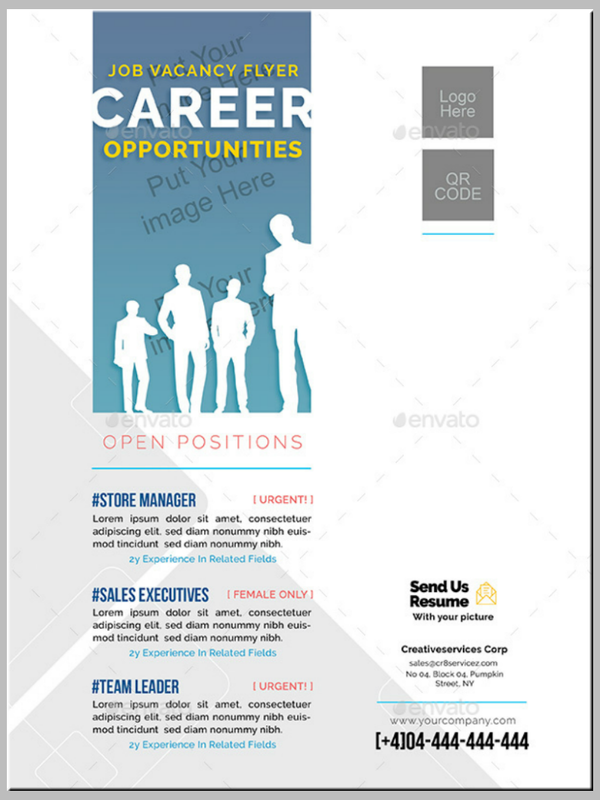 Before we proceed to the end of this article, were you able to find a particular flyer template that works best for the type of job that you are offering? 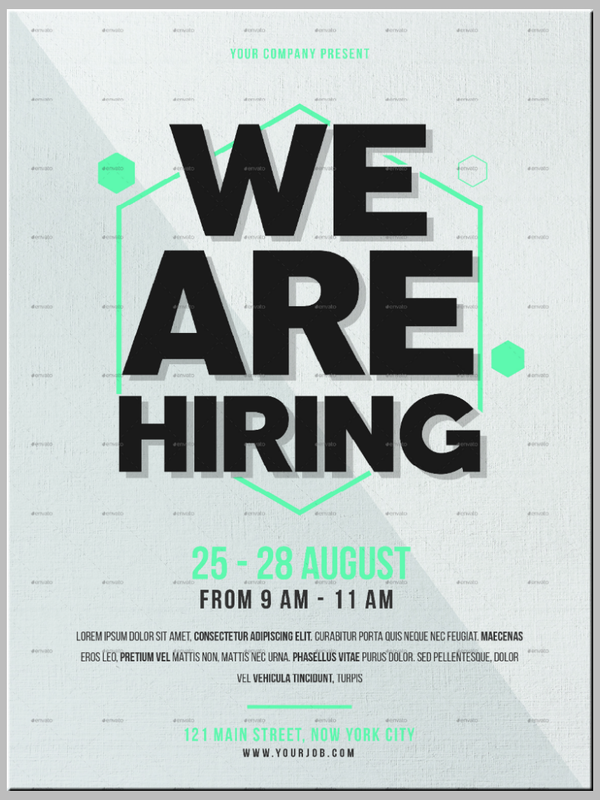 We are hoping you were since we have already gathered up what you need for your job recruitment campaign. 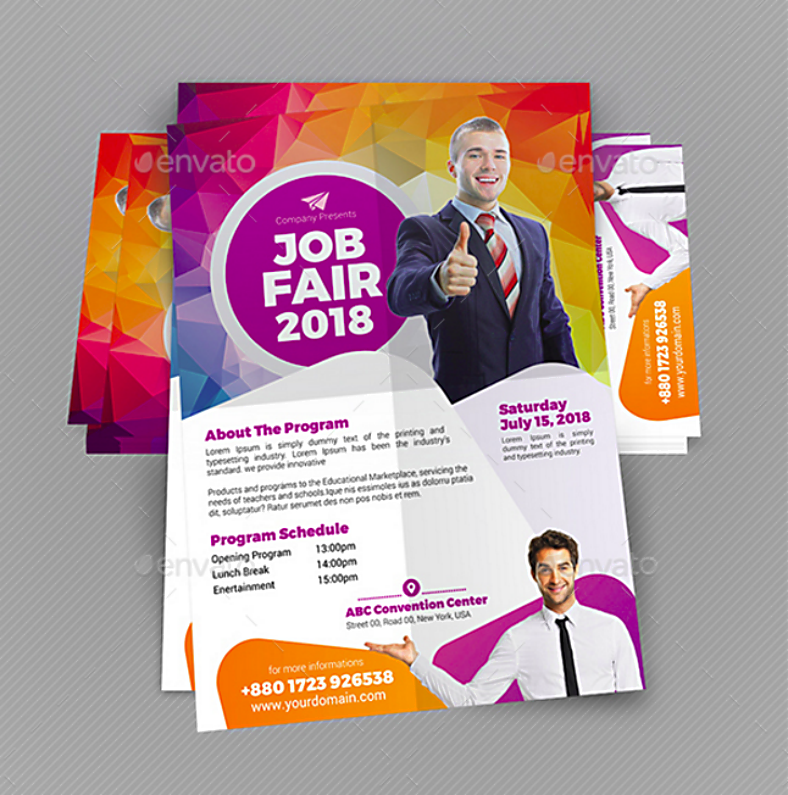 During the gathering of these templates, we actually had to go through various sources and picked out not only the best, but the most exceptional ones from among hundreds of visually stunning job flyer templates and designs that we have found on the internet. You may also see invitation flyer templates. Even with that said, we are aware that you may have a few reservations with regards to the quality of these templates and whether these are indeed worth downloading. These were actually designed by some of the world’s leading graphic artists who know how to make designs eye-catching. And these templates are also fully editable, and will allow you to make as much changes as you want depending on your preferences. However, you may need to have the necessary editing tool to be able to enjoy the template’s full editability. 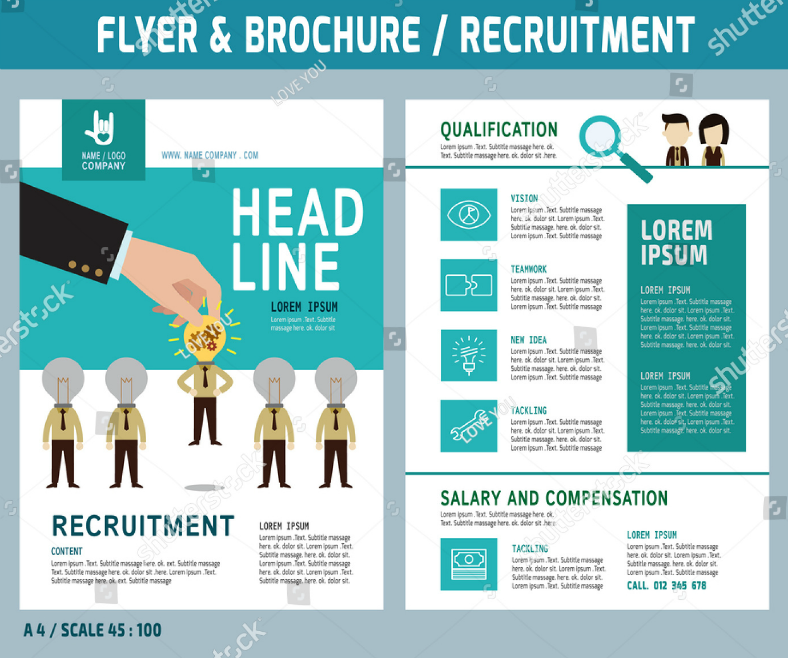 Downloading these job flyer layout templates is not as hard as you may think, it can be done simply with a click of a button, and considering the small size of these templates, downloading will only take a matter of seconds. And lastly, with regards to the cost for downloading these templates, you may be able to download them for a highly reasonable price, and that is a guarantee. 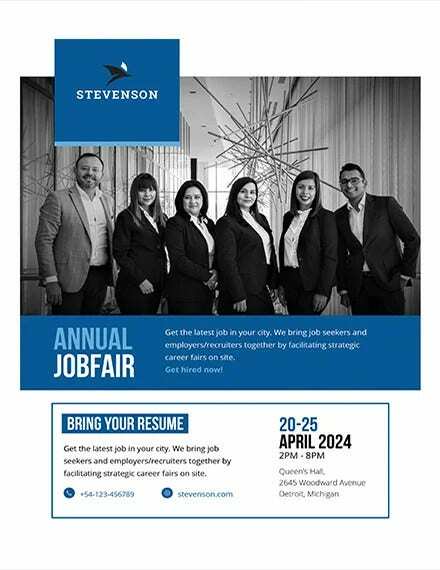 Now that we’ve got that covered, download your own job flyer template now and start accepting applicants for that position that you are offering.